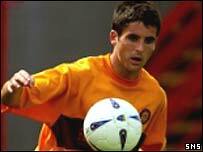 Plymouth Argyle's latest signing Keith Lasley admits it was a wrench to leave Motherwell but cannot wait to play in the English First Division. Lasley is manager Bobby Williamson's fourth capture from the SPL after he signed a two-year deal at Home Park. "I had a good season last year and I think it's time to move on and have a go at the First Division," said Lasley. "It'll be a different style of football here and I'm looking forward to raising my game to play at this level." He added: "It was a hard decision to make because it's my first major move away from a club. "But it was a decision I had to make and it was the right decision. "It goes without saying that I will get the chance to play against a lot of big clubs and it will be an exciting time." Lasley admitted the impressive facilities at Home Park played a large part in his decision to quit Scotland for the Pilgrims. "There are a couple of other new players as well so it won't be a problem settling in," he added. "I've had a look about and I'm very impressed with everything I've seen and there is no reason why we shouldn't be optimistic for next season." Lasley joins former Hibs defender Mathias Doumbe, midfielder Lee Makel from Livingston and ex-Dundee striker Steven Milne at Plymouth.